Peter Toulson’s funeral wasn’t particularly unusual. It took place in a chapel at Leeds's Lawnswood Crematorium, and included a mid-range coffin, Bitter Sweet Symphony by The Verve, and tributes and stories from friends. However, it was paid for people who were pretty much strangers. Mr Toulson, a seller of Big Issue North, who died aged at the age of 52, had become homeless in the 1990s after spending months in hospital. He had no money when he died, no address, and was estranged from his family. Two of his friends, who wanted to make sure he didn’t have to have a public health, or so-called ‘pauper’s’ funeral, set up an appeal on the website JustGiving. They hoped to raise £3,000 but, thanks to the generosity of 331 people – some of whom had never even met Peter – amassed more than £5,073. The extra money went to charity but they were able to do what they’d pledged to – create “a funeral befitting of a proud, dignified, lovely man”. This approach – using crowdfunding to raise funds for funerals is becoming increasingly common in the UK, with the number being paid for like this soaring in the past year. JustGiving says donations raised through its website between January and September 2016 funded more than 2,000 services – four times as many as for the same period in 2015. The £9,000 raised for the Hindu ceremony for five friends who drowned at Camber Sands last summer came through JustGiving crowdfunding, and 145 donors contributed £2,433 towards the funeral of Charles Birmingham, a cyclist who died in Greater Manchester. In Suffolk, 37 supporters raised £1,150 for a headstone and parish council charges for Claire Blair, who died of cancer in 2014, while, most recently, a crowdfunding page to fund the funeral of Anita Szuchs, a 30-year-old cyclist killed in London, topped £7,000. The rise is due to a combination of the increasing cost of funerals – now roughly £3,700, with little help for available for those in particular need – and the general awareness of and rise in the use of online crowdfunding. Charles Wells, chief operations officer for JustGiving, told the BBC recently that crowdfunding offered a practical way for friends, family and the community to come together and help. And certainly, an online appeal is particularly powerful when death is unexpected, happens in adverse circumstances, or leaves a young family bereaved. A sympathetic and generous response is also more likely when the deceased themselves is young, or when they would otherwise have a public health funeral. JustGiving users raised an average of £1,300 each towards funeral costs in 2016. 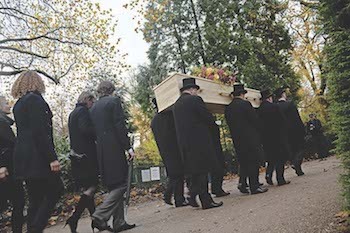 Public health funerals – some 3,500 in total – cost councils £1.7m in 2013-14.